I went home to Madison, Wisconsin this past week. It was a family visit that turned into a funeral, but I don't want to dwell on the sad part of the visit too much. My father and grandparents lived on the east side of Madison (Monona actually), very near Olbrich Gardens. It was a favorite place of my Grandfather Orlan. It's also a place my father, Jim, loved and a place I love too. The Olbrich Gardens began in the 1950's and has increased in size and scope ever since to include the Bolz Conservatory and wide variety of gardens. There is even a beautiful Thai Pavilion. We held my father's "Remembrance" party in the Atrium at the garden and it was perfect. Just a small gathering of friends to remember someone special. Before the gathering started, I managed to step away and have a private moment for myself in the Bolz Conservatory. 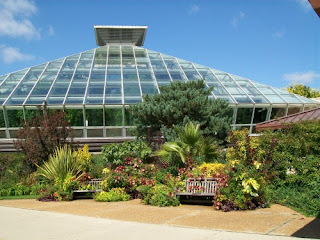 I wandered into the Bolz Conservatory ($2 entrance fee), which is a hot house pyramid full of plants native to tropical and sub-tropical regions. It's a little tropical oasis in the snowy winter. The dome is packed with over 650 different plants. It's like walking around in the jungle. Upon entering, I was immediately greeted by the fragrance of a beautiful Stanhopea in bloom. I didn't have a lot of other time to wander the rest of the garden, so I'll have to save that for another time. Below is a little visual tour of the inside of the Bolz Conservatory. So glad you got to spend some time here, it looks like just the thing to warm you from within and set you to remembering happy times. You've had a hard time of it lately. I'm glad you could find some solace in these beautiful plants. Thanks for your sharing these plants.